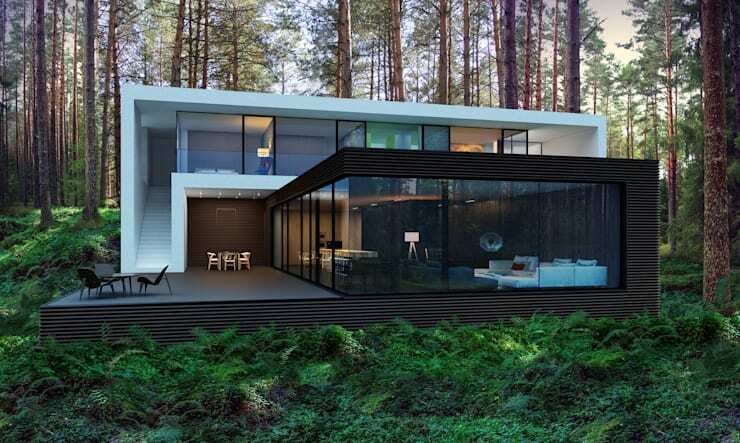 Ukraine architects Aleksandr Zhydkov present us with a breathtaking house in the forest today, which displays cutting-edge architecture, incredible design and modern magnificence. We are going to see what award-winning architecture is all about! As Herbie Hancock said, I like to be on the edge, on the cutting edge, or be into the unknown, into the territory where I have to depend on being in the moment and depending on my instincts. Today is a tour of the chic, the trendy and the sophisticated. The first impression of the home is absolutely extraordinary. It's large and significant and yet at the same time it's subtle, blending beautifully into the lush forest around it. The designers have opted for neutral colours including white and wood, which work dramatically with the large glass sections of the house. The home almost becomes one with the nature around it, as if by osmosis. 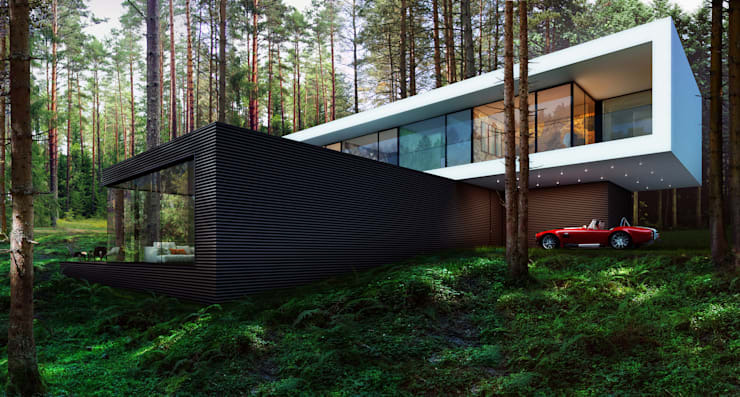 Also have a look at this: Jaw-dropping home hidden in the forest. If we move into the interior of the home, we come to the kitchen first. 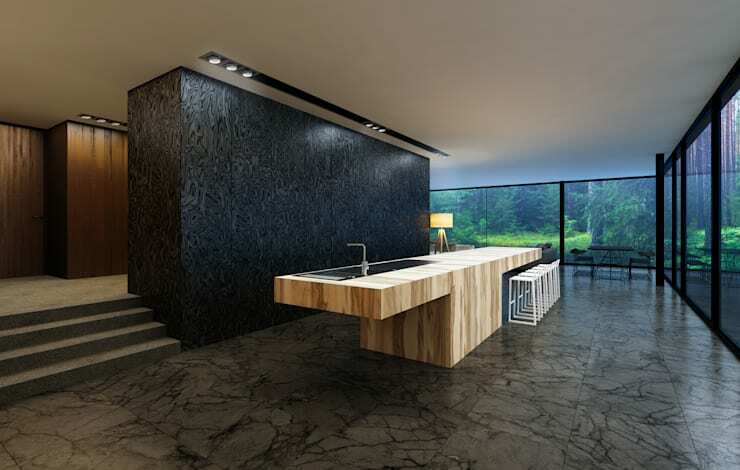 Have you ever seen such a breath-taking and impressive kitchen? It's minimalist and modern as well as open plan. There is a wooden slab, which is used as a breakfast bar. There are also stylish and high-quality grey patterned tiles as well as charcoal tiled walls. The light wood and dark tones pack quite a punch. Don't you love the little bar stools perched on the right of the bar? The design is sleek, with only the functional elements used in this space. There are large glass windows and doors that surround this entire area, making it feel just a little bit like it's one with the outside. It also gives the home panoramic views of the entire forest! 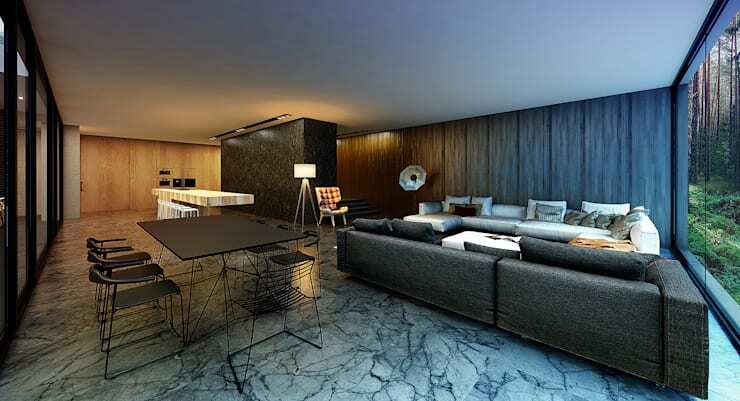 If we move into the open plan living room and dining room, we can see just how elegant this design is. Every little detail is of top quality. The sofas are grey and silver—gorgeous tones that bring a classy and luxurious look and feel to the room. The classic black dining room table and chairs, which are thin and petite, add an edgy and sophisticated touch to the room. But the designers haven't stopped there. They have placed a beautiful and tall lamp, a cushy armchair and an old photographer's flash in the room—adding wonderful touches to the room. Having a look at the living room products for inspiration for your own living room! If we spend a bit of time looking at the living room, we can see how the designers have added a beautiful and cushy silver rug to the room as well as a few colourful cushions. Just because a home is stylish doesn't mean that it shouldn't be comfortable. In fact comfort and sophistication should collide! We also get a clear view of the incredible views from this space as well as how the living room and dining room spills out onto a fabulous patio. The designers have even included modern furniture outside. Every last detail has been thought through! We end off our tour looking at this home once again from the outside. We can see how the designers have created gorgeous volumes, putting a long white rectangle cubicle on top of a dark square cube. There are so many facets to this design, making it bold and striking. The designers have found time to include a driveway, however! And it comes with a flashy car! A gorgeous piece of architecture can shine bright, even when it''s in the woods. In fact, look how incredible design can work hand in hand with the wonderful nature that surrounds it.